Mascara Most Wanted Mascara & Eye Liner Set Only $19.50! Down From $58! 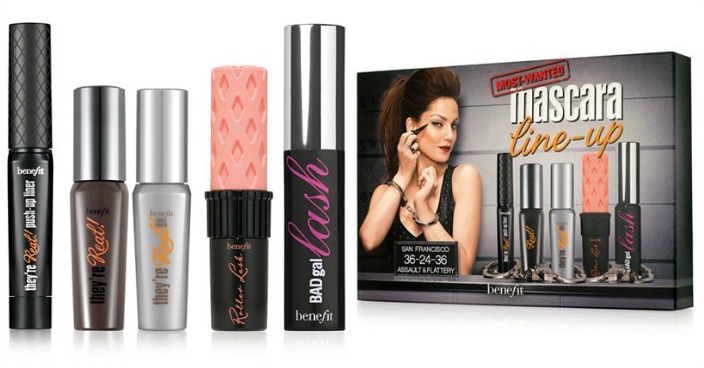 You are here: Home / Great Deals / Mascara Most Wanted Mascara & Eye Liner Set Only $19.50! Down From $58! Macy’s has this Mascara Most Wanted Mascara & Eye Liner Set on sale for $19.50 (Reg. $58)! What is it: A limited-edition lash wardrobe that includes four bestselling mascaras that tint, prime, lengthen, curl & volumize lashes plus an eyeliner for bigger, sexier looking eyes! Benefit’s iconic mascaras, new lash primer & bestselling gel eyeliner pen are together at last—and ready to create bigger, badder and sexier eyes! These five formulas give lashes out-to-there length, flirtatious 12-hour curl, bodacious volume, and 24 hours* of lash-hugging definition. Layer them up or wear them alone for beauty’s “most-wanted” lash looks.